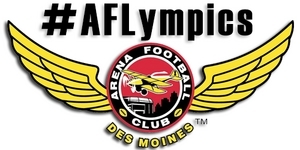 Barnstormers to Compete in "AFLympics"
CHICAGO - Arena Football League fans can help their team bring home the gold this year, as the AFL will host the first-ever "AFLympics", the League office announced today. Beginning on Monday, February 10, the Iowa Barnstormers will join the opposing 13 AFL teams in a ten-day social media contest during the Winter Olympics in Sochi, Russia. Each day at 11:00 a.m., the Barnstormers will use the hashtag #AFLympics to share a photo to Facebook, Twitter, and Instagram that best represents the team franchise, Des Moines, and supportive fans in the "event" of the day. Iowa fans will have until 8:00 p.m. each night to 'like' and retweet the team's AFLympics post. So, on behalf of the entire Barnstormers family, we need your help! Season tickets are on sale now for the Barnstormers 2014 season for as little as $110 per seat. Season tickets make a great gift for the football fan in your family. So, don't miss a minute of the action this season! To order your seats or for mroe information, please call the Barnstormers at (515) 633-2255, or log onto www.theiowabarnstormers.com.